Life-size bronze Cougar statue recreated from a sculpture done by Antoine Barye (France) in the late 1800's. This is a beautiful sculpture with the cougar stalking down a tree ready to pounce on his prey. The anatomy of a cat (feline) is almost identical among various species. 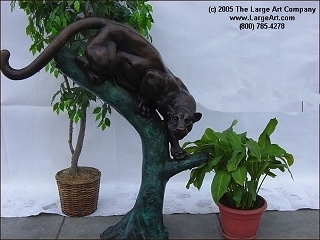 When cast in bronze, a cougar looks just like a panther, mountain lion, etc. etc. This is a very cool sculpture and would make an excellent mascot for a school or university. Yes, we accept purchase orders and are an approved US government contractor. Measures 56" tall x 46" wide and 22" deep. We normally cast this piece with the brown cat and highlights of green on the tree as shown in the pictures. However, we can also do it in all brown or a light brown cat and dark brown tree or any combination you like.